Rafi sahab is probably the only singer whose voice would suit all actors and stars irrespective of the decade and their age. Even though Raaj kapoor, Manoj Kumar, Amitabh Bachan and Rajesh Khanna were considered synonymous with Mukesh, Mahendra and Kishore , the songs Rafi Sahab has sung for them occupy a special place in the careers of these actors and HFM in general. For example who can forget eternal melodies like “baazi kisene Pyar ki sung for RK in film Nazarana”, “ Bhari Duniya mein Akhir Dil” sung for Manoj Kumar in Do Badan and “Teri Bindiya Re” sung for AB in Abhiman. There are many more such beauties that Rafisahab has sung for these stars. Needless to say all these stars had and have the greatest love, respect and admiration for Rafi Sahab. Example, Raaj Kapoor was also very fond of Mukesh and was very particular to have the best songs for his films. Sangam was one such film that had great melodies many of which have become immortal. Mukesh has wonderful songs in the film and Rajendra Kumar had 2 songs one a duet sung by Mahendra and a monumental rendition by Rafi sahab, Yeh Mera Prem Patra Padkar. This was the last song recorded in the film and RK was already celebrating about the beautiful songs SJ had composed picturised on him until he heard Rafi Sahib’s rendition and the thespian could not put himself back and sources say RK echoed his sentiments when he said “yeh gaana tho sab gaanon par bhari hai”. He kissed Rafi sahab and told him that this song would live forever, how true. In fact Rafi Sahab always had a special song in most RK produced movies including the mesmerizing Sadke Heer tujpe from Mera Naam Joker picturised on RK himself. However in this article, there are 2 very interesting facts that I like to share with you that involves Rafisahab and the star of 70’s, and 80’s, Amithabh Bachhan. The first one is the recording of the song “Chal Mere Bhai” from Naseeb where AB sings with Rafi Sahab. In this song Rafi Sahab play backed for Rishi as most of us know. A day prior to the recording, Laxmikant-Pyarelal the music directors had told AB that the recording was scheduled for 1 o’clock and asked him to come on time as Rafi Sahab was very punctual. So much so that the musicians even set their watches correctly based on the time when Rafi Sahab entered the studio. Next day, Rafi Sahab and AB reached the studio almost at the same time at 12.30 in the afternoon. Rafi Sahab saw that AB was appearing shaky and nervous and his eyes were bloodshot. Rafi Sahab asked him the reason for this. AB said, “Rafi Sahab, I have been listening to your songs since I was ten. Today when I have got the opportunity to sing with you, I have not been able to sleep the entire night.” Rafi Sahab smiled in his customary style and said, “Dost, sleep has left me as well because today I have to sing with a much big superstar.” Hearing this, AB fell to Rafi Sahib’s feet. Rafi Sahab was and is indeed the Super Star of all stars. In an interview conducted much later after July 1980, when asked about Rafisahab, this is what AB says: (the expression on his face when speaking and the tone of his voice when speaking about Rafisahab was of genuine admiration and respect. AB said: “I have never come across a person of such excellence, grace, dignity and warmth. He stops and says, I need to tell you about an incident. “We were on a tour with Rafi Sahab and others and Rafi Sahab was the key attraction of this international tour. The tour was for 2 days and Rafisahab had to sing on the first day and another singer was due to sing on day 2. Indeed Rafi sahab was unique and high in everything he did, truly the Super Star of all Stars. The other incredible incident is linked with another Amithab film, Abhiman that was released in the early 70’s. As we all know the script was about AB and Jaya who are both singers in the film and obviously this would demand having one playback singer’s voice for each for them. The music director was Dada Burman who in 70’s used Kishore extensively just like in 60’s he used Rafi sahab. All male songs were to be sung by Kishore and Lata had to do playback for all songs picturised on Jaya Bhaduri for it would look weird to have different singers when the script demands otherwise. The script was demanded a dialogue from the actor David after the song (tere bindiya re)ended that “ the character of Jaya was a better singer than the character played by AB. OOPs!!!!! Kishore gracefully declined to take up the song saying that it would not suit him. One cannot blame him for doing so especially after such a dialogue. SD Burman approached Rafi sahab to sing it and the gentle and simple giant without even thinking of the script agreed to sing although sources close to Rafi Sahab also told him to give this song a miss. Rafi Sahab was unique in all ways and above any such fears and apprehension. Also this demonstrated the admiration and respect Rafi sahab had for Dada Burman. People have heard this song that mesmerizes us even today and even the most ardent fans of Lata have accepted with grace that although Lata sang well as she usually did, she is a distant second in the song that Rafi Sahab absolutely nailed. I feel for Lata and the Hrishi da, many told Hrishida to change the dialogue after the song but he thought these dialogues were essential for the script although they sounded weak and out of place especially after what people heard after the song was recorded. Rafi Sahab was and is still the Super Star in every aspect. Sources have told that Mukesh was called to sing after Kishore declined to sing the song. Mukesh was to sing 2 songs including the duet that Manhar sang in the end as Mukesh was on a tour and could not arrive on time for the recordings. The fact that 3 male voices were used proves the fact the SB Burman and the film makers wanted to avoid all embarrassment and controversy. Simply incredible!!!!!! However all this makes us arrive to only conclusion and is Rafi sahab was the most genuine and the greatest Super Star we have seen. Whether it was the 40’s or the 50’s or the 60’s or the 70’s or even the 80’s or any other era, his voice and persona reigns supreme and unmatched. Where no singer would dare to go, Rafi Sahab fearlessly marched with full confidence, where no singer would dare to dwell, he went with a smile, conquered and ruled. Truly a true emperor, a true Super Star of all stars. This tribute that was sung by Mohammed Aziz was picturised on none other than Amitabh Bachan proves the unmatched and magnificent status of Rafi Sahab. This entry was posted on Sunday, April 29th, 2012 at 12:27 pm	and is filed under Meri Awaaz Suno. You can follow any responses to this entry through the RSS 2.0 feed. You can leave a response, or trackback from your own site. to Rafi Saab only.If you need to glorify somebody please visit other sites. Indranil, no one is glorifying RAFI over Kishor or anything. We are just telling basic facts that RAFI’s song ‘teri bindiya re’ was the best song for the film ‘Abhimaan,’ and it is clearly overshadowed all other songs. Despite the song not originally intended for RAFI and the relative bias/politics shown in the film situation (female singer sings better than male singer) RAFI made the song his own and no one could stop him showing his superiority to every other singer. It is a fact that RAFI is the GREATEST SINGER of all times, I admire all our legendary singers great in their own way, but facts are facts. Mohd rafi saheb is the king of the singers of the universe. He is greatest singer of india as well as whole Universe . He is emperor of music world. We miss him.We remember him each and every moment. when i listen to the great Mohamed Rafi i just cannot stop getting emotional. my eyes just swell up with tears of joy. his voice just moves me. This article gives goosebumps and spells out loud the super persona of Rafi Sahab. May his soul rest in peace and Allah the almighty award him highest place in Jannah. No doubt rafi sahab was the greatest singer of all tmes. may god rest him in peace. Please do not compare with any of these singers. They all are individual institutions on their own. I request the blogger of this site for not glorifying Rafi saab better than Kishore da saying such abnormal facts like Abhimaan song Tere Bindiya Re … there is no such records or autobiography published where these facts are given. It was entirely the music director’s choice as per situation demands. Actually Teri Bindiya Re is more popular with fans till date and has more listeners requests by about 3 or 4 times as Tere Mere Milan Ki Yeh Raina. So actor David saying in the film that Lata sings better than Rafi, but not Kishore was proved false. MD.rafi is a ocean in singing world. It is not only that also he was a man of mindful and joyful heart.I.e. many time he give up his song royalty. Rafisaheb is, was and will Rafisaheb. From Saigol to Sonu Nigam and from Nurzahan to Shreya Ghosal, everybody had /has God Gifted voice but Rafi saab’s voice was God’s own voice. A singer like Rafi saab comes once in a millenium. Kishore,mukesh,lata,mannadey they are the star of the music but rafi sahab is the sun of the music when sun arise all star became dissapear rafi sahab not only a great singer but also a human being, lata kishore they always selfish nature many controvercies are behind them “jab rafi sahab unche sur lagate to lata bhi unka saath nahi pakad pati thi mien aur kya kahu rafi sahab ke bare mein duniya ka kagaz mil jaye sari dawaat banakar kalam banakar saraswati bhi likhengi to shabdo mein bayaa nahi kar payengi” you are really a god rafi sahab………..
we listen many songs on lp record are diffrent than 78 rpm.lp records are made from sound track.Many songs have one stanza extra in lp record,bcoz there was no limit of time ,78 rpm song was maximum 3 minutes and some seconds,in lp there are many songs which are more than 4,5 minutes long. 78 rpm.which is called original song,and has more value than lp records. to give some songs the upcoming singer ‘mano’ at that time. Another theory that had done rounds in those days is that song ‘Loote koi man ka nagar ban ke mera saathi…’ was actually rendered by Manhar as shadow singer. This technique of shadow singing had come into being sometime in late 60s. I don’t know whether I am using the right terminology (shadow singing) but it implied that if due to some reasons main singer being unavailable, some lesser singer would sing that portion of song for film making to proceed unhindered, and later on availability of main singer, that portion would be replaced by rendering of main singer. Manhar used to be the principal shadow singer those days. Coming back to that particular song, for some unknown reasons the song was retained with Manhar. If this theory of shadow singing for this song is correct then, who actually was the main male singer in Dada’s mind remains a mystery. Incidentally it may be mentioned here that first time this shadow singing concept used was for movie ‘Vishwas’. 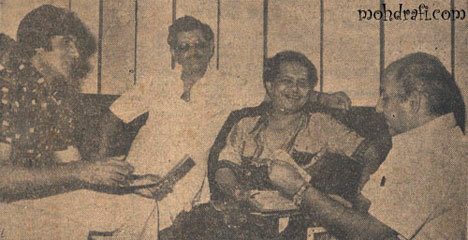 Manhar had sung a couple of songs which were to be replaced by Mukesh’s rendering. But later when Mukesh heard those songs he insisted music directors Kalyanji Anandji to retain the songs as Manhar had done a very good job. Truely a noble soul that Mukesh was. That wonderful gesture of ensured a kick start for Manhar as an independent singer. Can anyone think of any singer doing it in present times? Those were the days of such great people. I came across an interview of dev anand where it mentions that sd had tuned “dil aaj shayar hai” from gambler for rafi but kishore snatched it away. imagine rafi singing the lines ‘dil aaj shayar, gham aaj nagma’. your thoughts?. dada-rafi surely hit a six with this composition (btw I love your cricket analogy vis a vis sd), and they would have done the same with “badi sooni sooni hai” had rafi delivered that song. the ipzn solo also has dada using one of his favourites, roopak taal, to great effect. While on mili, as per yogesh, sd was not happy with pancham’s treatment of kishore’s songs in mili. also, it was yogesh who sang out the tune of “aaye tum yaad mujhe” to kishore, which he heard from sd, who was in the hospital by then. rafi delivered wonderful gems for dada in the 70’s from films such as ipzn, talash, anuraag, abhimaan etc., which rank among sd’s best during that period. keeping the above gambler anecdote in mind, and the interview of pradeep singhi which you posted, sd may have conceived other tunes for rafi (apart from the ones recorded), which did not materialize. during the 70’s, lata also weaved magic for sd in albums such as sharmilee, tere mere sapne, us paar, abhimaan etc. it was lata who was sd’s main singer in the 70’s, just as rafi had been in the 60’s (as mentioned by you in post 51). I agree, the entire male score of abhimaan should have gone to ‘saatwan sur’, he would have done wonders with those compositions. after “teri bindiya re”, my pick from abhimaan is “ab to hai tumse”. Notice the excellent way in which dada has used the guitar, along with the violins and rhythm. My compliments to Salim-ji for writing such a fabulous article. Very interesting and thought-provoking. I met R. D. Burman at the function marked for the pre-premier launch to create awareness of the movie ‘Hare Rama Hare Krishna’ (1971), and its music, held at Kala Mandir – Calcutta in 1971. I was able to attend it, courtesy my contact in ‘The Junior Statesman’ published from Calcutta. I had accompanied my journalist-contact, and had the privilege to ask a few questions in between. The conversation was held in Bengali, interspersed in English and Hindi. PS: Dada, your father and you have firmly placed Kishore da as number one singer, displacing the versatile Rafi sahib. RDB: You tell me, what is the gain for Baba or me in trying to make Kishore da or Rafi sahib or Manna da as number one or two or whatever? PS: I don’t know your preference perhaps. RDB: No, there was no design in or intention by Baba or me to promote Kishore da as number one. It just happened with Rajesh Khanna’s image and the songs of Aradhana that were loved by all, particularly the younger generation. Bas, click ho gaya. PS: But you have clear preferences for Kishore da over Rafi sahib even though Rafi sahib has given you many hit numbers in your early career. RDB: Look, I have great regard and respect for Rafi sahib. He is, undoubtedly the most versatile singer, and, whenever I have a composition suitable for him, I get him to sing for me. The only thing about Kishore da is that, I change or alter or improve my tune till the last moment, even at the time of recording. In one or two occasions I have stopped recording that was almost complete, to bring some change, that I feel will make the song better. Kishore da is just great in adapting to these instant changes very fast, just as quick as I make the change; he is able to perform it on the microphone. This makes it convenient for me to record with Kishore da, that’s all. Aur unki awaaz ka bass meri compositions ko bahut suit karta hai. RDB: Abaar bolchi (I am saying this again), Baba and I have no preference for one singer over the other. It is the mood of the composition and the recording convenience that determines the singer. Biman ji, thyank you. Rafi sahab commands respect in all ways. I am just one of his fans that shares his views. Thanks for sending the link too. i am with you on your views. Was the song :tere bin soone nain hamare” in that song Lata got a drubbing by miles. Rafi sahab is a music industry on his own and like they say ” bandar kya jaane adrak ka swad”. great to interact with you. thanks for your respect rafi sahab and his fans. A Rafi Sahab’s fanfare is to be organised shortly in Mumbai shortly for more interaction between them with mutual contribution. The title song of “Hum kisishe kam nahin” is my number 1 favourite from the film; I may be one of the very few people who like it more than the chartbuster “Kya huwa tera wada”. I actually like it even more than the much more popular Rafi qawaali from the same period. It’s an amazing composition by Pancham. The title song of Mukti, in my opinion, is good, but the top-class spin of the Pancham-Rafi combo is present in the 60s songs, not in the 70s. Take, for instance, “tumhe dekha hai” from chandan ka palna. After the recording, Pancham had remarked, “But Rafi saab, I didn’t compose this tune.” The song, unfortunately, didn’t get the popularity it deserved. To me, the ultimate Pancham-Rafi delivery is “Tumne mujhe dekha”; nothing comes close to it. This song can rival any soft romantic song that Dada or Jaikishan composed for Rafi. Pancham tried his best to exploit this multi-layered facet of Rafi’s voice in the late 70s (e.g., in ZKDH), but couldn’t come up with anything close. The Rafi solo that is number 2 in my Pancham list is “Wadiyan mera daman”. In “Teri Bindiya Re”, it is true that Rafi trumped Lata. But if you want to see a real drubbing, there’s a Rafi-Lata duet that was composed 10 years earlier and picturised on Dadamoni. Dada had sung the composition himself in Bengali earlier; I can’t find it on youtube, otherwise I’d have posted it. This is one song where Rafi is miles ahead of Lata. This is a priceless composition, but as it happens so often, never hit the popularity charts. Hear the underlying pathos in Rafi’s voice and then you know why I strongly feel that he’d have done the same with “Badi sooni sooni re” had he been given the opportunity. Rafi might have complimented Kishore for his “dukhi man mere” rendition, but I’m not a big fan of the dukhi songs of Kishore. The truth is that the singer whom Dada couldn’t stand delivered two of the most memorable sad songs for him — “O jaanewale ho sake to laut ke aana” and “Chal ri sajni ab kya soche” — much better than any sad song that Kishore ever delivered for him. And, to be honest, “Chal ri sajni” even overshadowed — if that’s possible — Rafi’s masterpiece in the same film, “Saathi na koi manzil”. There is a possibility that even ‘badi sooni sooni….’ was composed with Rafi in mind. Do you have any information on this? The scale is more towards the Rafian territory than the Kishorean. If one listens carefully, even the singing is Rafian or to put it differently Kishore, seemingly, was trying to be all that Rafi was in the song. Post 54 – binuji you have hit a six by your post. Halder ji the bias against Rafi sahab is clear when we see Kishore singing for Dilip Sahab in Sagina. I know a ardent kishore fan who said that is just too much to digest Kishore doing playback for Dilip Sahab. There were instances when Kishore did playback for Biswajit and Joy Mukerjee under the Burmans that again shows the bias. Several if’s and but’s to the half song of mohd rafi saaheb……but it lingers on in the minds and hearts of music lovers. in the seventies rafi saaheb had fewer songs from the burman clan but whenever an opportunity came, rafi hit it for sixes – to use the cricketing term. kya huwa tera wada and hai agar dushman dushman were hit for maximum by rafi saaheb – and many of the songs of seventies are stll heard today. we will present live at our mumbai event : Mera man tera pyaasaa, caravan gujar gayee and many other rafi beauties on may 18th. What Pradeep Singhi has written makes me believe that Dada had composed the tune with Rafi in mind. Maybe he didn’t think of using it for Abhiman. It’s highly possible that he would have used a different tune if Kishore had sung. There’s a Rafi solo that Dada had composed three years earlier with a striking resemblance to “Teri Bindiya Re”; listen to the tabla beats and you’d know the seeds for “Teri Bindiya Re”. As far as I know, Pancham was not intimately involved with Abhiman, so I can’t lay the blame on him. But there’s another Hrishi da film, again a song on Big B, where Dada couldn’t be in the recording room. Pancham and Kishore completed the act together; good song but not destined for the greatness the composition deserved. This song, in Rafi’s voice, would have easily been one of the top 10 songs in the 70s. From what I’ve heard, Dada was not amused with Pancham’s treatment of the song. Halder bhai, interesting post. I agree with your assessment. However the question is who made the decision Dada or Pancham. or was it to protect Kishore? as we all know Kishore declined to sing the song which speaks volumes of the clout he had during those days. I have also known from a very genuine source that it was Kishore that asked dada to ask Rafi sahab too sing it because he thought it would suit Rafi Sahab more than him. The bottom line is that Lata had to face the embarassment and as a very senior Music critic said ” dada surely got his priority wrong”. The bottom line is also how Rafi Sahab was above all these tricks and politics, a mark of a true and everlasting legaend. As I’ve stated before, in my humble opinion, Dada should have given all the three duets to Rafi and Lata; the solo was a good fit for Kishore. Salim bhai has already explained why the third duet went to Manhar. But I still wonder why Dada chose Rafi for the “Teri Bindiya Re” when the goal was to prove that the female singer was better. Did he intentionally back stab Hrishida and Lata? I’m going to say a few things that some of you may perceive as controversial but I’m willing to face the flak. In my humble opinion, there have been very few music directors who could read the pitch as well as Dada did. And, as a shrewd tactician, he should have known that it’s very difficult for anyone to beat Rafi with spin. The amount of spin that he puts on the delivery makes Lata look flat. One possibility is that Dada had conceived the tune with Kishore in mind. The other possibility — and I concede it’s a remote one — is that he wanted to figure out how his current No. 1 singer performed in tandem with his No. 1 singer from the 60s. The eccentric that he was, maybe he wanted to experiment and finally got a kick out of it. In Dada’s hands, Lata is sublime! She is like the Kanchenjunga you see from Tiger Hill during sunrise. When Dada gives her water, she turns it into wine. But why would he turn to spin with Lata, knowing Rafi’s overwhelming strength in this area? This is really puzzling to me, given the script. If I were in Hrishi da’s shoes, I would have asked Dada to go for pace, where Lata can get really deadly — it would have been a barabar muqabla, an unees-bees situation.